A visit to Abu Dhabi is incomplete without visiting the grand mosque. Here are some interesting facts about Sheikh Zayed Grand Mosque - one of the largest and most beautiful mosques around the world. Your visit to the capital city of the United Arab Emirates is incomplete without paying a visit to the Abu Dhabi Grand Mosque. I recently visited Abu Dhabi and one of the first places I wanted to go was the Sheikh Zayed mosque. I must say that Sheikh Zayed Grand Mosque is simply the best place you will see in Abu Dhabi. The grand mosque is beautiful, huge, and a wonderful example of modern Islamic architecture. In this article today, I wanted to present some fascinating facts about Sheikh Zayed Grand Mosque. 1. Sheikh Zayed Grand Mosque is one of the largest mosques in the world. The building complex of the mosque covers an area of more than 12 hectares and measures around 290 meters (960 Ft) by 420 meters (1,380 Ft). 2. Around 41,000 worshipers can worship at the same time at Sheikh Zayed Grand Mosque. The main prayer hall can accommodate approximately 10,000 people. 3. Different building materials were sourced from many countries like Morocco, Egypt, Turkey, Greece, Italy, Germany, Austria, New Zealand China, India, and Pakistan. 4. 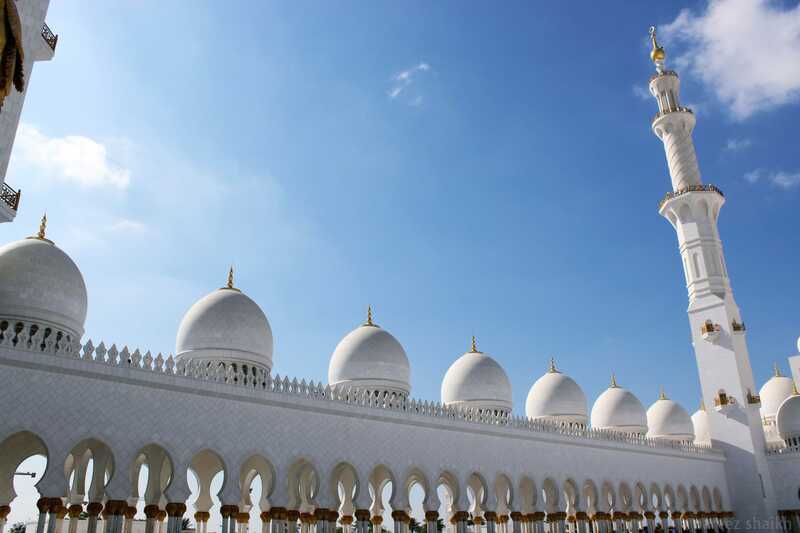 The beautiful design of Abu Dhabi Grand Mosque minarets combines Mamluk, Ottoman, and Fatimid architectural styles. 5. The beautiful carpet in the main prayer hall is the world’s largest hand-knotted carpet. It took around 8 months to design, 12 months to knot and 2 months to transport, trim and weave the pieces together. Approximately 1,200 workers from Khorasan province at the Iran Carpet Company turned this 5,700 square meters carpet into reality under directions of Iranian artist Ali Khaliqi. 6. Sheikh Zayed Mosque houses seven crystal chandeliers made by Faustig, a Germany-based firm specializing in crystal chandeliers. The chandelier present in the main prayer hall weighs around 12 tons and is one of the largest chandeliers used in a mosque. All chandeliers are made from gilded stainless steel and brass using approximately 40kg of 24 karats galvanized gold. 7. There are 82 domes of various sizes at this mosque. The largest dome is located in the center of the main prayer hall. The outer shell of the largest dome is 32.8 m (106 ft) in diameter and 85 m (279 ft) high. The inner side of these domes features traditional Moroccan artwork. 8. Sheikh Zayed Mosque features a unique lighting system designed to reflect the phases of the moon. There are 22 light towers which project soft clouds of a ‘bluish gray’ color on the exterior of the mosque. This light changes according to the moon phase every night. 9. 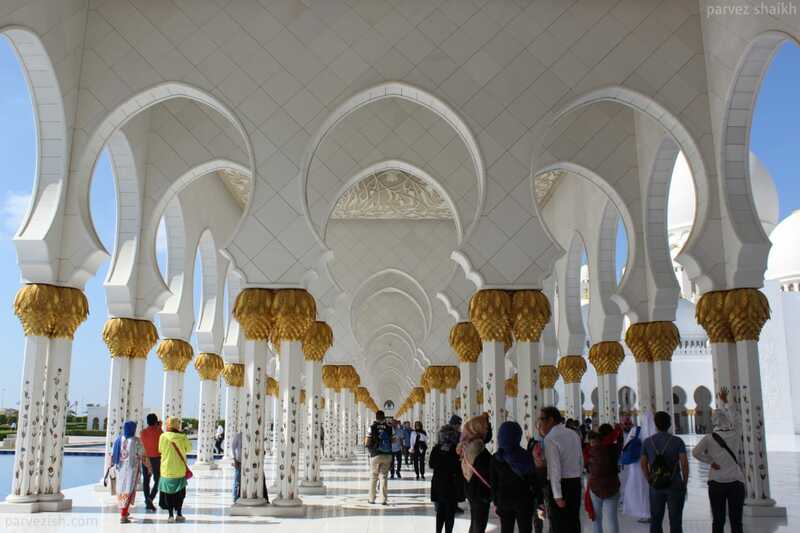 The design of the Sheikh Zayed Mosque has been inspired by Persian and Mughal architectural styles. The building is also influenced by the Abu al-Abbas al-Mursi Mosque in Alexandria, Egypt. 10. 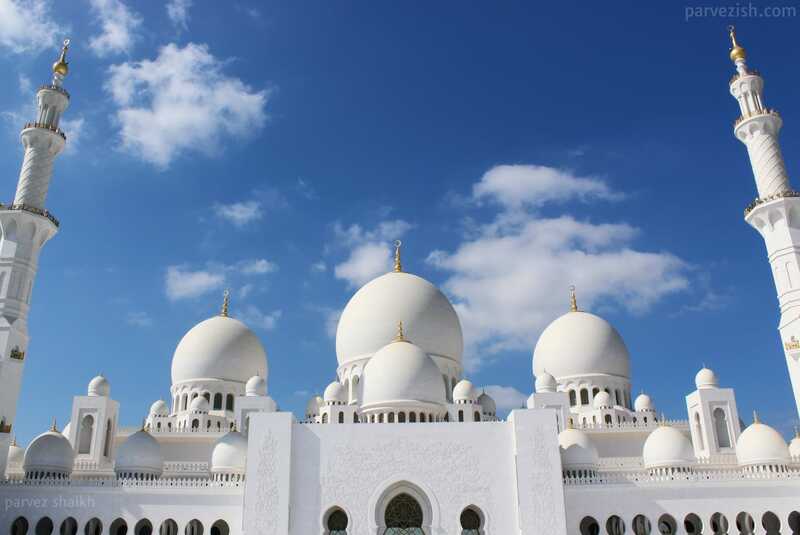 The construction of Sheikh Zayed Grand Mosque began in 1996. It took more than 3,000 workers and 38 contracting companies to construct the mosque. It was opened for worship in 2007. 11. Abu Dhabi Grand Mosque was named after the founding father and the first president of UAE – late Sheikh Zayed bin Sultan Al Nahyan. His final resting place is located beside the mosque. The dream project of late Sheikh Zayed bin Sultan Al Nahyan, Abu Dhabi Grand Mosque celebrates peace and diversity in one of the most beautiful ways possible. If you are planning a visit to the United Arab Emirates, make sure to include this beautiful example of modern Islamic architecture in your list. If you are planning a trip to Dubai and would like to visit Sheikh Zayed Grand Mosque, you can book an Abu Dhabi sightseeing tour from Dubai. This full-day tour includes Abu Dhabi landmarks like the Grand Mosque, Etihad Towers, Abu Dhabi Corniche, and heritage village. Wish to spend a few days in Abu Dhabi? Checkout popular activities and book them in advance. That will be all, folks. 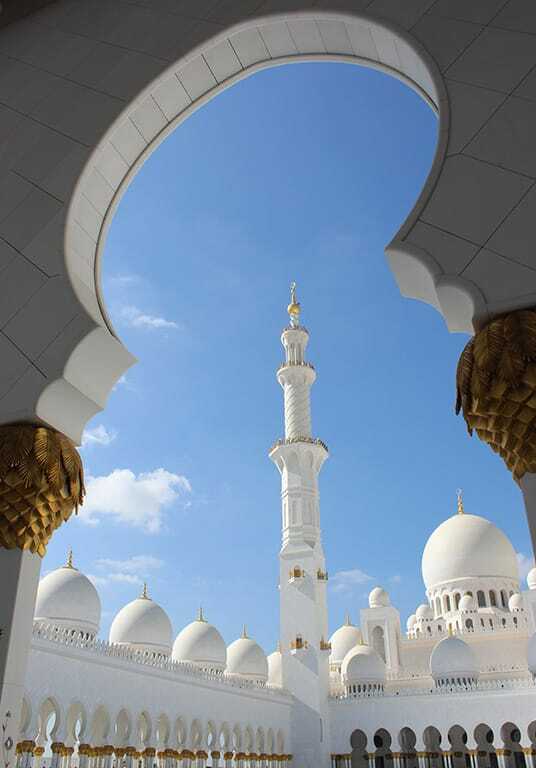 This was Parvez and you were reading 11 Fascinating Facts About Sheikh Zayed Grand Mosque, Abu Dhabi on Parvezish.com. I will be back with new travel experiences soon. Till then, keep wandering. 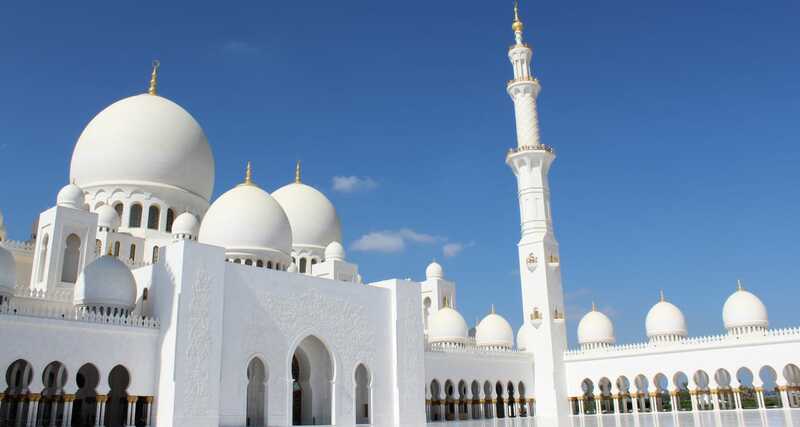 Have you visited or planning to visit the Abu Dhabi Grand Mosque? Do share your experience with me! If you liked this article, please share it with others. What an interesting detail about the largest and beautiful mosque in the world. It’s very touching to see how deeply these Emiratis are rooted to their tradition and they don’t spare anything to preserve it. It’s amazing to learn that the mere thought of building a religious place to such a magnitude has touched their hearts, and they followed it as well. Kudos to those workers who have sweat and slog to build this magnificent mosque, and the minds of engineers, architectures, and interior designers for constructing something unique that made even the gods to raise their eyebrows. Yes Akshay. Sheikh Zayed Mosque is a beautiful mosque, indeed. One of the places one must visit during their UAE trip. Where was the carpet designed and woven?? Hi, Ashley. The carpet was woven by approximately 1200 workers from Khorasan Province at the Iran Carpet Company under directions of Iranian artist Ali Khaliqi. We all know there are 82 domes of 7 different sizes in Grand mosque. Can you advise on 7 different sizes and number of Domes in each size? Hi, Manish. Thank you for your interesting question. It made me read more about the mosque and I tried to find different sizes of the domes at multiple sources. All I could find, however, was the size of the largest dome. The outer shell of this dome is 32.8 m (106 ft) in diameter and 85 m (279 ft) high. I will keep looking for the exact answer to your question and update the article to reflect the same once I find a reliable source.